It’s easy to hold resentment for others who have what we want. And it’s also a total cop out freeing oneself from personal responsibility for change and transformation. And while this book doesn’t address our resentment for others who hold what we desire, it does clearly articulate ways we can change—ways that are digestible and entirely doable. In fact, they’re so subtle yet effective it’s embarrassing no one’s addressed these before now. Behavioral change can be important on two fronts: 1) Our personal effectiveness and success and 2) Our ability to get along, collaborate and create with others—despite our differences. What is so powerful about this book is that when we can see that we don’t necessarily need to make a wholesale change in who we are to be more effective—that it can be as simple as a few go-to statements or physical behaviors choicefully delivered—perhaps we can let go of the animosity we hold for others. Or maybe we could just plain admire them for the gifts they have that we can learn from. This would be a really great thing—for our workplaces, and for our world. 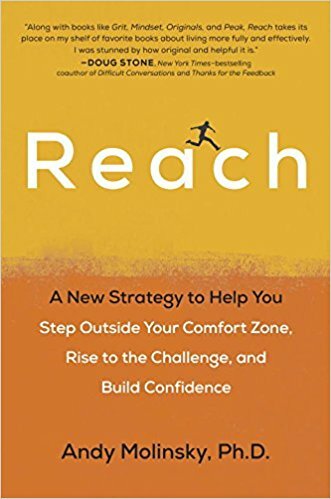 Reach is chock full of useful stories and examples—of real people, just like you and me. I wished I would have had this book early in my career. I would have been able to see that I can change, I can become more effective, and it doesn’t require that I morph into someone or something wholly different. All I must do is try.